The last episode of Downton Abbey’s Season 3 saw the Crawleys (minus the Irish black sheep, Tom Branson, who is home with the baby) off to Scotland for their annual journey to field and flora. Robert Crawley for one was glad to return to the embrace of tradition after having been forced to face the urgent need to modernize the economic base of Downton Abbey in order to survive the changing times. There will be tartan and tweeds, fishing and frank talk, shooting and stepping out at the ghillies’ ball. Yet always present is the fact that, just as Scotland is NOT England, the new century will be very different from the last. Consider the arrival of Michael Gregson, Lady Edith’s amorous very married editor. Like a latter day Edward Rochester from the bildungsroman novel Jane Eyre, he is trapped in an undissolvable marriage to an insane wife. In Bronte’s book, the heroine runs from a romantic relationship with a man so encumbered. A more modern Lady Edith struggles to understand the situation and seemed to finally accept the possibility of a shadow relationship. Yet some things don’t/can’t change or there will simply be no order/no meaning in the English world of manners. One such tradition is the need to savor hot tea in all times of stress and strain – but a proper cup of tea. And what is a ‘proper cup of tea’? NOT something brewed hours before sitting (and cooling) in an impersonal thermos. A correctly made cup of tea requires fresh hot water. In short, it requires a fire either in a kitchen or where if one is outside fishing or hunting? Enter the fabulous Kelly Kettle. Created in Ireland by an avid angler named, yes, Kelly over a hundred years ago, it is the perfect (and an in-the-known) answer for how to obtain hot water without burning down the surrounding forest or grasslands. Simply fill the outer lining with water and then light a small fire in the core cylinder and in an amazingly short time one has fresh piping hot water for tea (or warming toddies). But no tea is complete without sweets. Once again, what’s possible is a comfortable home setting, doesn’t transfer with equal ease and grace to the Scottish moors. Yet tradition must be maintained. And the Scots, of course, have an answer. Just have a tablet. Not a tablet of medical or digital fame, but one of absolute culinary glory. What we are referring to is a heavenly Highland treat that is neither a piece of candy nor a slice of fudge but something wonderfully different. Made simply from sugar, butter and condensed milk cooked slowly to a ‘soft ball’ stage (235 degrees), it is compact, delicious and an ideal companion to an outside cup of tea. For you see, with tea and a sweet in hand, any subject can be discussed (at least in the world of Downton Abbey’s third season) from unhappy marriages to alternative relationships. Shocking, but so very English. And the resolutions? Well now, they’re to be revealed in Season Four, possibly this Fall or Winter. The next Season is currently being filmed with Lady Mary, it is rumored, moving into the central role. So until then, enjoy a heartening cup of tea with one ‘tablet’ of sweet delight and cheerfully chant “patience, patience – soon, soon”, but with an English accent, please. 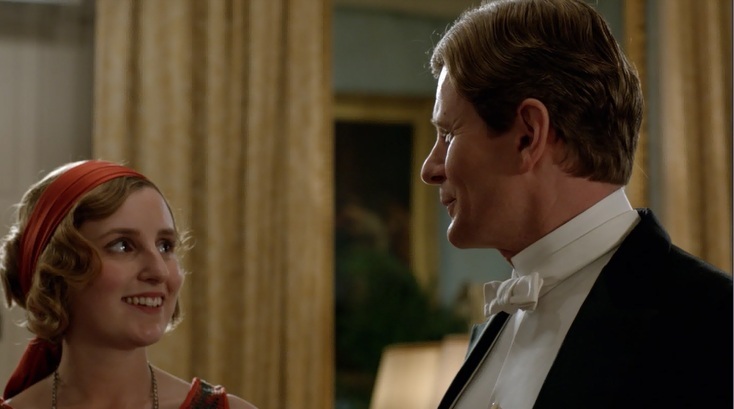 Posted on February 20, 2013 by Ana Kinkaid and filed under Alcohol, Beverages, Camping, Cocktails, Cooking, Cuisine, Culinary History, Design, Dessert, Films, Food, Great Britain, Movies, Recipes, Spirits, Sports, Style, Tea, Travel, whisky and tagged Downton Abbey 3 Downton Abbey Food Fishing Ghillies' Ball Hunting Jane Eyre Kelly Kettle Last Episode Season 3 Micahel Gregson Robert Crawley Scotland Tablet Sweets.